Tatami's new rashguard combines detailed artwork with functional training gear. The designs and graphics are all very intricate by design, and then sublimated into the fabric for a long-lasting fiber-infused print. Tatami's panel construction provides an accommodating fit that maximizes mobility and range while you train, with each panel held together by durable flatlock stitching. Constructed from a blended fabric, combining polyester and spandex to balance lightweight features with stretchiness and comfort. 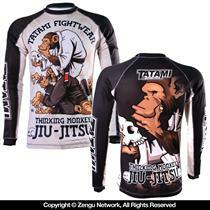 Email your friend about the Tatami Custom Rashguard: Thinker. Ask a question about the Tatami Custom Rashguard: Thinker.